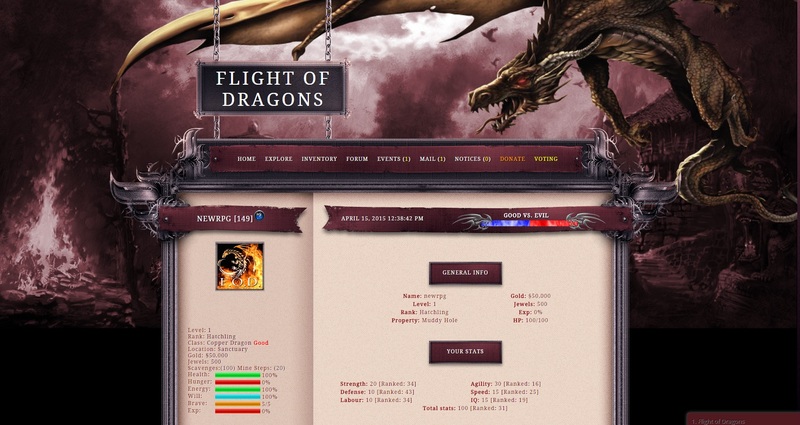 Flight of Dragons is a fantasy text based browser game. Choose your class as a dragon and level up your character. Explore the city, lots of places to visit like item market, council bank, questings and more. Energy-bar based system with jewels and gold values with scavenger and mining. Live chat and in-game forum (same account as your character). Take courses, create a guild and do “act of kindness” or “act of evil” endeavors. You can equip a melee, attack weapon, breath weapon, chest piece, tail barding, amulet and control your spells. 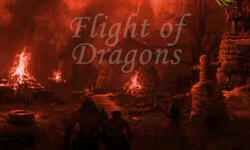 Visit Flight of Dragons website! It’s all about control, do you have it? If you look below Vengeance is Mine has a great break down of the game. Personally, unlike ViM, I’m not bothered (yet) by the mouse movement requirements. I like the interface. I like the attempt at turning what are crimes in similarly formatted games into good or evil endeavors. Generally, it’s been a pleasant experience and for fans of this format, I’d recommend trying it out. It has a number of humorous aspects but no spoilers from me. You’ll have to see for your self. I just started and it seems fun to me so far. Definitely a game you wouldn’t want to miss out on. A great pass-time if you’ve got nothing else to do, but it’s also very complex with a decently high skill ceiling. Like dragon theme games…still learning a lot thing, used to play similiar games the other days and verry addictive. Its nice to play this game… Events here are cool. This game is great, I recommend it due to its easy to grasp game mechanics, friendly players, exciting forums, and responsible staff. Easy to learn especially with different types of tutorials. Friendly staff, and plenty to occupy your free time. Similar but different from the usual war games in that you’re a dragon. The dragon you choose can be evil or good and each has its own characteristics. So far, a fun game. Addictive, fun, interesting and imaginative – in this day and age where gaming competition exacts extraordinary effects and gameplay, this one carves its niche among the best yet its simplicity is surprising. Great community, lots to do, time spent on Flight of Dragons very simply makes you feel good. Flight of Dragons runs on the same engine as games such as “Unholy RPG” and “Eternal Duel”. 1. Your dragon has a “Hunger” bar, and you can feed your dragon. I worried initially that such feeding could become as tedious as feeding in RPG games 30 years ago; however, after a full day of gameplay, I have not needed to feed my dragon yet. 2. Although the developers have obviously put significant effort into a visually appealing interface, it forces me to use my mouse wheel FAR TOO MUCH. * The banner with its huge dragon image is too tall. 3. Not possible to sort the Item Market listings (e.g. by Price). Moreover, on my screen, there’s a bug–the “type of item” buttons overlay the “Remove All” button. 4. Compared to “Eternal Duel”, which is properly tuned, Flight of Dragons seems a little too easy to play. NO, I am NOT a power gamer! However, for example, when I crawl “The Catacombs” in “Eternal Duel”, my character occasionally gets thrown in jail or the hospital; in Flight of Dragons, by contrast, “Scavenging” is like shooting fish in a barrel. I’ve always loved this type of browser games, and this game definitely delivers! Just started but I like it already. Lots to learn and do. So it’s got me very interested. Though i m newbie in this game, i believe i will love this game, since the appearance and features are user friendly. The concept of dragons as rpg game is interesting, good job. Interesting and different. Look forward to learning all I can. Really enjoying the game. Wish I had found it sooner. very nice graphic, a lot of things to do, people always willing to help new players. It’s a really good looking and interesting text based game. Give it a shot! Great Game so far. Just started but seems to be a nice well planned out Game. Love Dragons so that’s a Plus. Super fun game. I definitely love this. Very clean cut, great members, and it’s easy to navigate! Admins are really friendly and respond to any problem you may have within minutes! Isn’t this game another clone from the long gone Eternal Duel MMORPG? Nice clean game…good graphics a lot to do and see…and cool peeps to meet..give it a try…and Take to the skies as the dragon of your choice! I am returning here just to share an experience with events. On the last weekend FoD was under a 24h event and I could play it along most of the day… and lots of pçayers were participating and having fun. Well, no need to say that this is the spirit of a game, right? i love finding new games, day 2 and there’s still a ton to do and based on the looks of it plenty of room for the game to grow. Only about two hours in to Flight of the Dragons and already I’m having to tell myself “FOCUS! FOCUS! FOCUS!” there’s so much to discover here! Very good game! A truly MMORPG with a good community and active staff. Also, admin is working on acessibility, so I strongly recommend eveyone to give it a try!!! fun game work checking out!~ nice staff! An easy to learn, fun browser game. It’s new, but there is already a lot of well-planned content. If you are a fan of dragons like me, this game is not to be missed! Pretty cool game. I recommend to give it a try. Start playing and you wouldn’t be able stop. I never thought the day would come when i see dragons ruling over the sky once again. The ultimate feel-good game. I love dragons, so i love this game!! This game is very well organized… i would say it is very user friendly, there is always some thing to do in the game.. a good place to come and have a lot of fun and to meet a few new friends. B est game ever and admins are great as well as the players come join the fun. I been playing for 2 days Flight of Dragons is the bomb!Its a refreshing take on text based games.Really cool I would recomend it too everyone.Give it a shot guys! A new interesting browser game that shows alot of potential! I’m truly excited that this is an 18+ game. The less 13 year olds I have to deal with , this game is the first of its kind I’ve played in a few years and I’m excited that this is the one that brought me back. The staff is friendly and actually an enjoyable part of the game too. I don’t think I’ll have to deal with staff who couldn’t care less about the little guy among the masses. Don’t take my word for it though, try it out yourself! just started but the game seems fun. Amazing game! Fair and friendly players all around, this game is surely exquisite in many ways! As something of a veteran of online browser games this has been the only one to make a lasting impression on me, the graphics, features, and great staff has made this my home game, with the rapidly expanding community and the unique opportunity afforded by being ahead of the curve in a flourishing game, I’d advise anyone to give this game a shot. I’m already working on getting old friends and enemies alike to give this game a look. Enjoying the game. Something different and looking forward to it growing as others build their strategy. Such a fresh new take on the classic rpg. Haven’t stopped yet. So come one come all. The game is very addicting and great atmosphere awesome admins and great people come join us!! you will have a blast! Awesome game.. Loving how there seems to always have something to do. Admin is great and friendly. Fun game. Perfect for passing the time! Over the years I’ve played several browser games like this (not exactly, I mean dragons is new for me :P) and currently this is 1 of 3 I play and I have to say for a new game I wasn’t expecting it to be this good already. The layout is unique and interesting, there’s so much to do and already a fun community of players, and unlike 1 of the games I still play the admin don’t seem to be jerks that don’t have time for their players. Definitely 5 outta 5 stars. Love This hot new game! The choices between 8 types of dragons is great and the Admins are awesome! Great game with an interesting theme. Very nice game lots of nice feature’s, active community and lots of friendly players. have not had many experiences like this before where i immediately felt welcome into the world of the game. Its steadily growing and already making a statement in my opinion. This is not going to be one of those games that is all about it’s HOF and top donators and I love that. VERY NICE work!!! Dude. This game is cool. Come join us. Good game with admin who are willing to listen to input and suggestions. FoD is an awesome game and I recommend it to anyone who like dragons and meeting people. The admin are helpful and nice, and the players are pretty chill. Amazing game, great community, friendly admin. It’s something different in the browser game world, a much needed breath of fresh air. Skies the limit for this game IMO. FoD is an awesome game to play! Friendly and helpful admin and players! Really like this game. Easy to learn and very helpful and friendly admin to show the way if you need any guidance. Great concept! Beautiful design, color choices are nice (for the template), not that hard to learn how to play it, lots of fun things to do, reasonable prices if you donate, nice players, wonderful and friendly staff, quick load time, no lag as of yet and many other pluses to joining Flight of Dragons. Great game and admins give it a try if want somethin new and good. 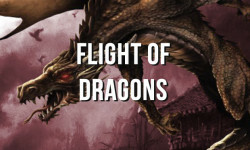 Flight of Dragons has a growing community of new and veteran players from other platforms coming together and intermixing in this fresh environment. There are plenty of daily activities to accomplish; and it caters well to the dedicated warrable, the casual player, and even creative roleplaying can be had here. Staff are nice and helpful, and treat players with respect. Come join our growing community!Have some fun, cause a little mayhem, or even find your long lost dragon mate. Well, what are you waiting for? I was a beta tester, and I am going to continue to play for a long time. This game is a fresh perspective on text based we games. It looks awesome and has great features! A new game that has just launched. Wow is all I can say! There is so much to be doing here, not the usual 3 or 4 dallies and that is you left waiting for the next reset or roll over. Forums are being updated quickly and there is even a chatroom or 2 if you join a Talon. All the admin seem to be friendly and helpful when asking questions . Visually lovely and there is a choice to change colours. I cant wait to explore more of the aspects of the game. ! Good job Admins. 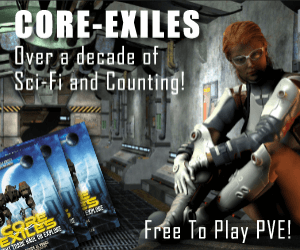 A new and interesting take on an MMO. I have been playing for a bit now and like any new game there have been a few small problems, but the Admins are friendly and attentive and quick to respond when any issues are pointed out to them. I see this one being around for a while. Great new game! I always knew there was a dragon inside of me. Love to spread my wings and fly. Crisp graphics, a lot of innovative features. Gamers, if you start, you’ll never stop !! !